Ledoux plein de terre: FloK'Art... what is it? Florence and Karel are two artists from Brussels who have been a couple for over twenty years: one a tall French-speaker and one a small Flemish-speaker! 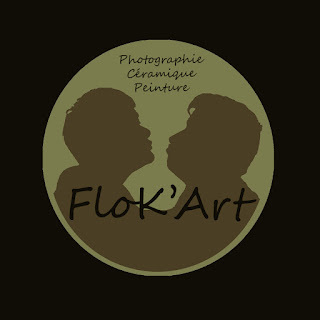 In 2015, they decided to bring their work together under the name FloK’Art. She is Florence Ledoux, and she has her head in the clouds. A nature-loving dreamer, she reads, writes, paints, sculpts and photographs – she’s multi-talented! Florence studied Romance Philology at ULB (Université Libre de Bruxelles) and trained as an artist at the Académie des Beaux Arts in Wavre. Since childhood, she has been immersed in the art world: her parents were publishers of art books in Brussels. He is Karel Fabre, and he has his hands and feet firmly on the ground. With a big imagination and a love of materials, he is a potter, ceramist-sculptor, musician and photographer. Karel studied philosophy at VUB (Vlaamse Universiteit van Brussel) and trained as an artist at the Anderlecht Académie des Beaux Arts in Brussels, then at the Académie des Beaux Arts in Wavre. He now works at Diana Bercovitz’s Tierra del Fuégo workshop. Florence and Karel live and work in the centre of Brussels, in the lovely Béguinage quarter, near Place Ste Catherine.